BarryNana; Don't Leave Him Hanging! In the run up to Go Banana’s For Fairtrade day, which is tomorrow (6th March), we here at Ethical Superstore have been racking our brains to come up with the most creative, entertaining, bizarre, and thought provoking banana-based activities! 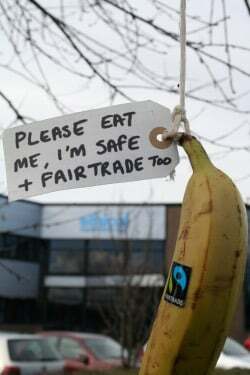 Late last week we had a trial run of our banana-eating-a-thon, a few more games and events are in the Top Secret pipeline, and over the past couple of days we’ve been trying to get rid of a Fairtrade banana by offering it to passersby. 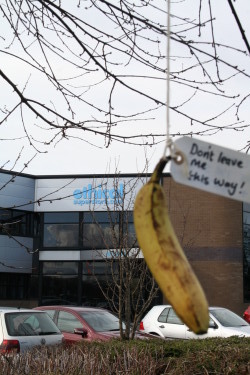 Let me explain; we tied a Fairtrade banana to a tree outside our offices so that it was hanging above the footpath within arm’s reach of any pedestrian, with a note attached saying “Please eat me, I’m safe & Fairtrade too!” in a hope of raising awareness of Fairtrade. BarryNana has received a few funny looks, been ignored, been pointed at, but not once has anyone attempted to free him from his state of limbo and indulge in some Fairtrade goodness. This got us wondering why people seem to be so adverse to freebies, why people seem to ignore what they don’t think is really there, and why people’s confusion or apathy leads to inaction or inertia. “An SEP is something we can’t see, or don’t see, or our brain doesn’t let us see, because we think that it’s somebody else’s problem…. The brain just edits it out; it’s like a blind spot. If you look at it directly you won’t see it unless you know precisely what it is. This is because it relies on people’s natural predisposition not to see anything they don’t want to, weren’t expecting, or can’t explain”. It’s an interesting thought and one which can seemingly be applied in a wider context; Climate Change continues to be ignored, even dismissed by some, Eco-friendly alternatives to more recognised brands get accused of Green Washing, and consumers continue to purchase the products they know they shouldn’t, from the manufacturers they definately know they shouldn’t! Here at Ethical Superstore we like to think that we go some way to tackle SEP and address people’s apathy and confusion surrounding issues that affect us all. 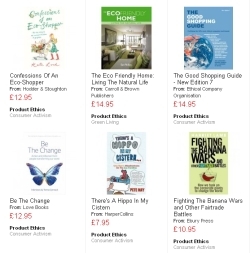 That’s why we continue to stock an impressive range of activist books with topics range from Fighting The Banana Wars and Eco-Fashion to The Good Shopping Guide and Confessions of an Eco Shopper. All the books we stock provide food for thought and a healthy dose of inspiration when it comes to all things green. Hopefully, together, we can eradicate the notion of our planet’s wellbeing and our people’s sustainability being Someone Else’s Problem. P.S. BarryNana is still hanging around if anyone wants to come rescue him . . .